There is some very heavy rain in parts of Italy this weekend, and Sampdoria-Roma was already cancelled because of it. It’s definitely raining very heavily in Rome, threatening our game, too. But even if the weather permits our match to be played, the torrential rain is not the only storm we face on Sunday afternoon. Lazio and the other Inzaghi are waiting for us, waiting to prey on our newly formed squad and pick us apart like the Aquile that they are. So even if the rain slows down, Lazio won’t. And it will be Milan’s job to weather the storm. Before the break, Lazio pulled out a 2-1 win over Chievo, even if their winner was scored in the 89th minute. But for that match, Simone Inzaghi lined up Strakosha; de Vrij, Radu, Wallace, Milinkovic-Savic, Parolo, Lucas, Lulic, Basta, Immobile, and Luis Alberto. It appears that Inzaghi could be without both Felipe Anderson and Djordjevic due to injury. However he will have Nani available, signed on a loan on the last day of the transfer market. Nani is on the way out of the Portuguese national team, while Milan have a young Portuguese player that Cristiano Ronaldo himself said was Portugal’s future. 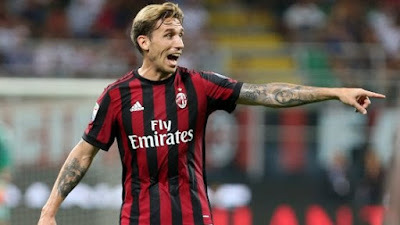 Speaking of Milan, we have something Lazio might be missing… their former captain, Lucas Biglia. I’m going to guess that the Lazio faithful will not be giving him a joyful welcome. Of course Montella will be missing Conti due to a sprained ankle, and Paletta may or may not be available. José Sosa will unfortunately not be available Sunday or any other day this season, because he is now on loan to Trabzonspor. "Hey, Lazio, I told you we were breaking up. Don't pretend you didn't hear me"
Now is where Montella will start feeling the storm. With 17 players who went out on national team duty and a Europa League group stage match this coming Thursday, he has to choose a strong squad, but keep in mind rotation of his players. Beating Lazio will be worth more than 3 points, because it would take 3 points from a team that finished above us last year. But we also have to keep something in the tank for Thursday. Going to the Olimpico and facing Lazio is always tough. But Milan have the extra competition to remember this time, and most of the team just returning from playing and traveling, too. If the game is not called off, the weather is likely to be very wet, and those are the kinds of games where anything can happen. It wouldn’t be a natural disaster if we lost, and would be almost like sunshine if we manage a draw, especially away. But if Milan can simply weather the storm and pull off all three points, then we will head into our Europa League fixture with blue skies. This match will be shown on BeIN Sports in the U.S.